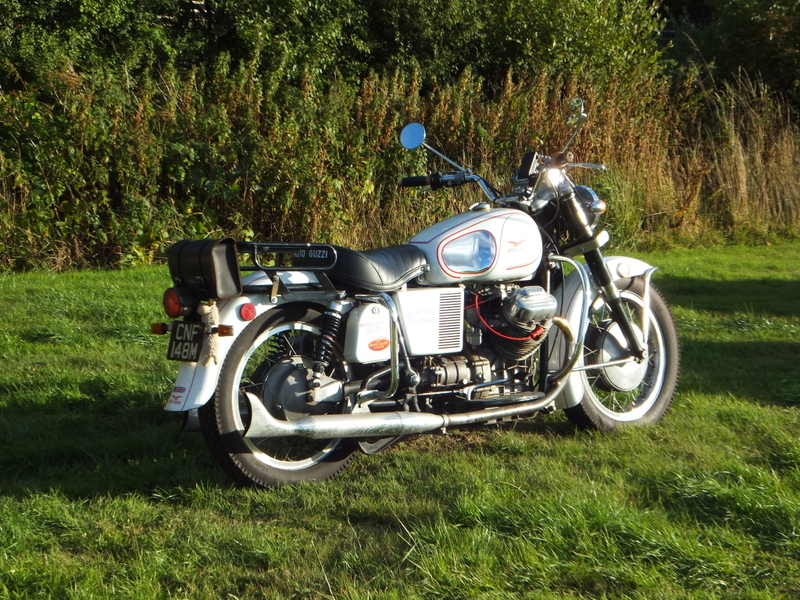 As I indicated in my last post, as usual, I attended the MGCGB Guzzi Festival which was held near South Molton in Devon this year. I had decided that I would be brave and go on the V7Sport and hope that I was not crippled by the riding position. Although I’m still pretty flexible, the heavy throttle and weight on my wrists can cause me problems and this would be by far the furthest I’d been in one day on it. 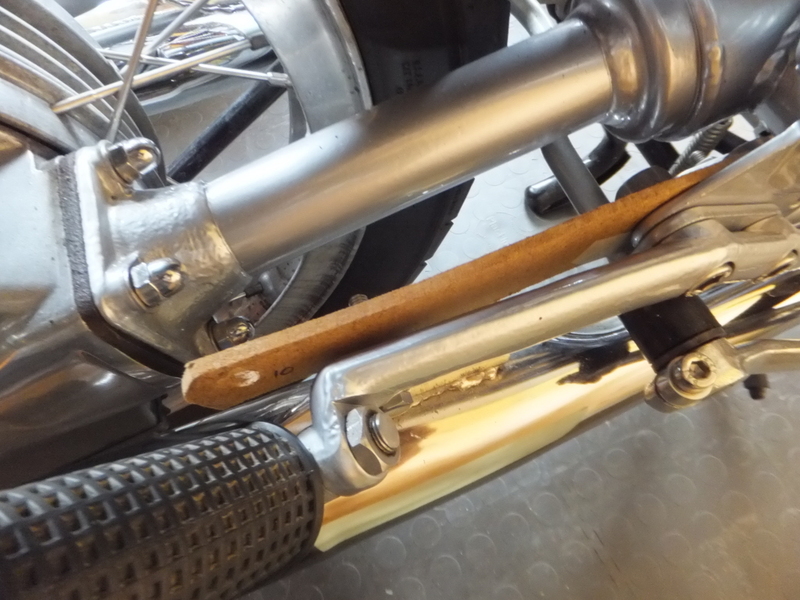 Another reason was that The Fire Bike feels like it needs to be “gone through”. It continues to be reliable but I think it might be a bit down on power and possibly getting a little tired. The trailer also need new tires. 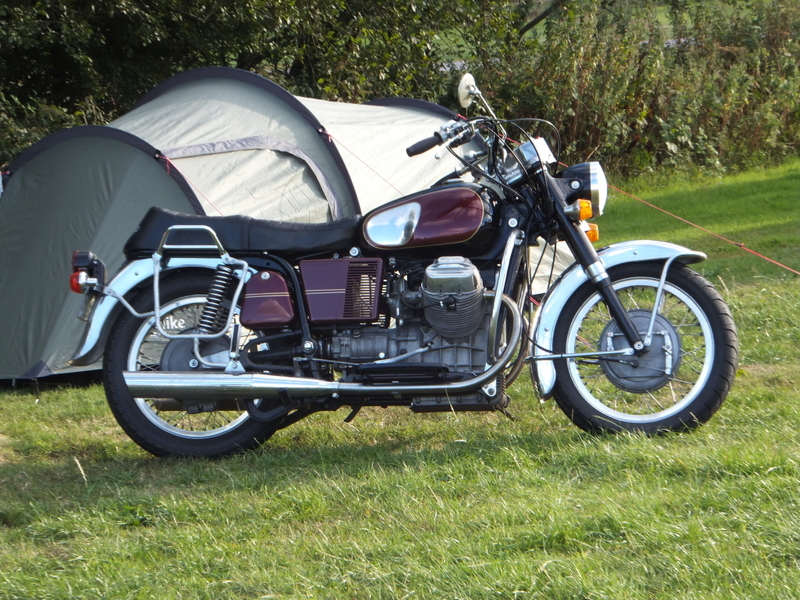 I bought a huge seatbag at the Llandovery Motorcycle Weekend last month in preparation for this jaunt. It was new old stock and appears to be an old version of the “Speedpack” by Bags Connection/SW Motech. It was very cheap which is always a good thing. The bag is actually in three parts. 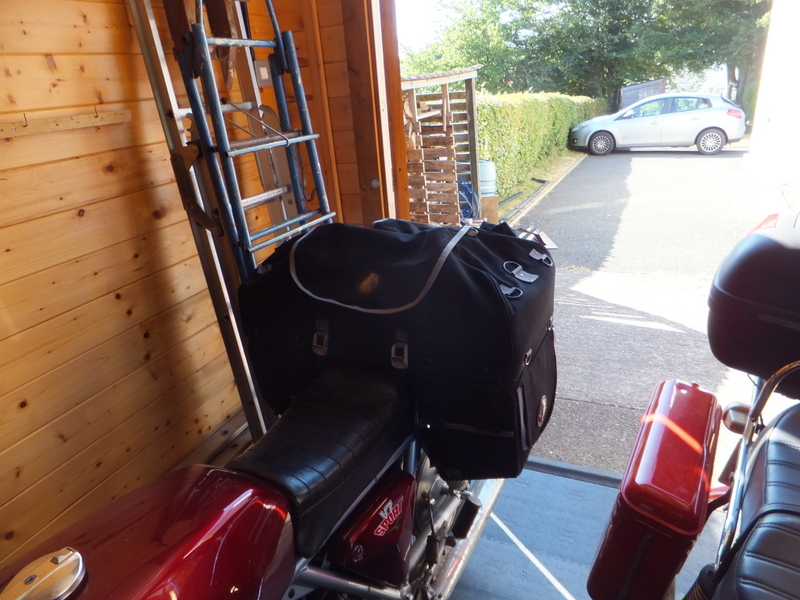 The main bit is fabric with some sort of aluminium frame in it and there are two rigid fabric side bags which fasten under it to give a pannier type arrangement. 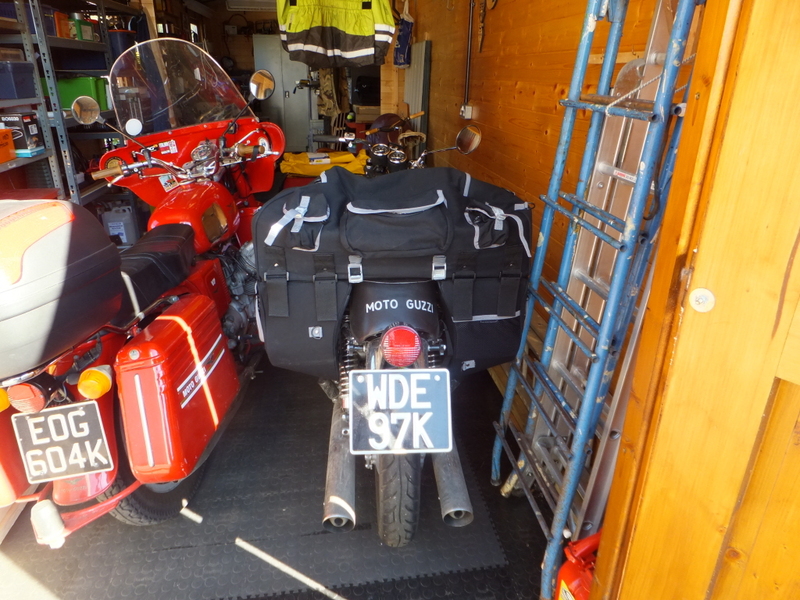 The whole lot is strapped down to the pillion seat without the need for a rack. If you look you can see that there is a fault with the set I’ve got. There are two right hand lower bags. 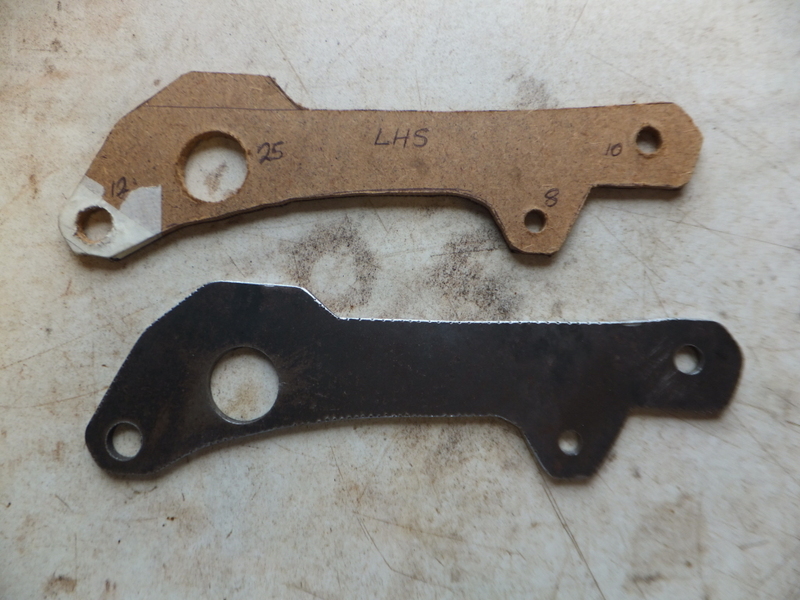 The left one is just fitted the wrong way round. It makes no difference as the shape viewed side on is the same. I decided that I would be travelling light without any cooking gear or such. It turned out that I could get everything for the weekend including my new smaller, more compact tent into the bags. There is a nice secure waterproof cover which was tested over the next few days. The weather forecast for the weekend was not good and the Friday departure day started off very wet. In fact, as the bike stood loaded up outside and I wriggled into my waterproofs, it was raining so hard that the rain was bouncing a foot and a half off the ground. As I went outside I questioned my own sanity but the rain stopped and the sun came out. It stayed mainly dry for the 200+ mile run to the Festival. I’d gone well over half way before I was briefly rained upon. Although the sky was black and the roads often wet it was the traffic and not the weather which became a pain. The motorways were choked with traffic and I filtered through what seemed like miles of stationary or barely moving traffic. I will only filter at about 25mph so you can tell how slow things were. I also witnessed a “Police incident” on the M5 where a group of police cars tried to stop a car. This resulted in a crash with the driver being pulled from his vehicle and then restrained on the tarmac. The already heavy traffic came to a standstill and, as the tailback grew, a number of motorcycles filtered to the front. After 15 minutes or so we were allowed past the scene with a “careful how you go” from the Police officer who waved us on our way. Faced with three totally empty lanes of motorway tarmac progress was what could be described as swift. 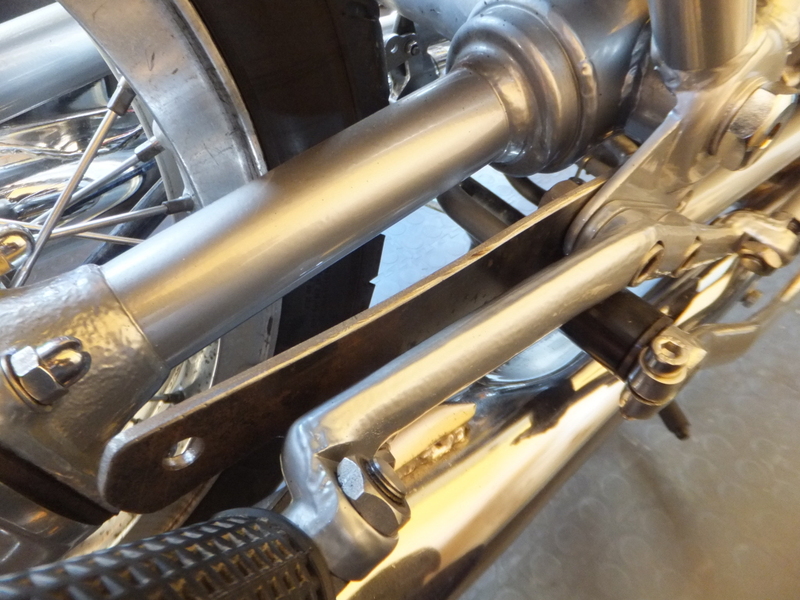 Some of the other bikes were quite a bit swifter than me! 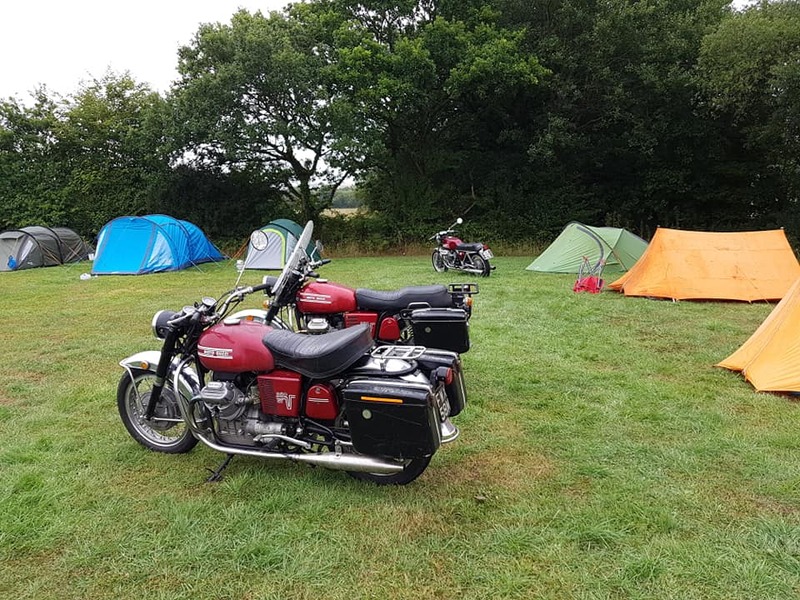 The campsite for the Festival was a field at the back of a rather nice commercial camping and caravan park with good facilities. 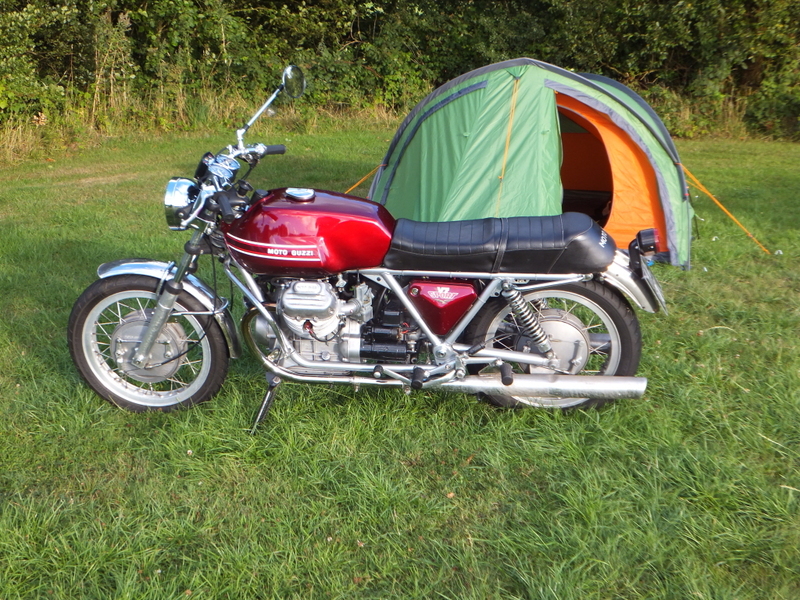 After signing in I was invited by Dave P to pitch my tent near him and two other loopframe Guzzi owners. The two very similar 850GTs belonging to Dave and Phil had been joined by Kev’s very nice 850 Eldorado. There was another 850 there that I don’t think I had seen before. 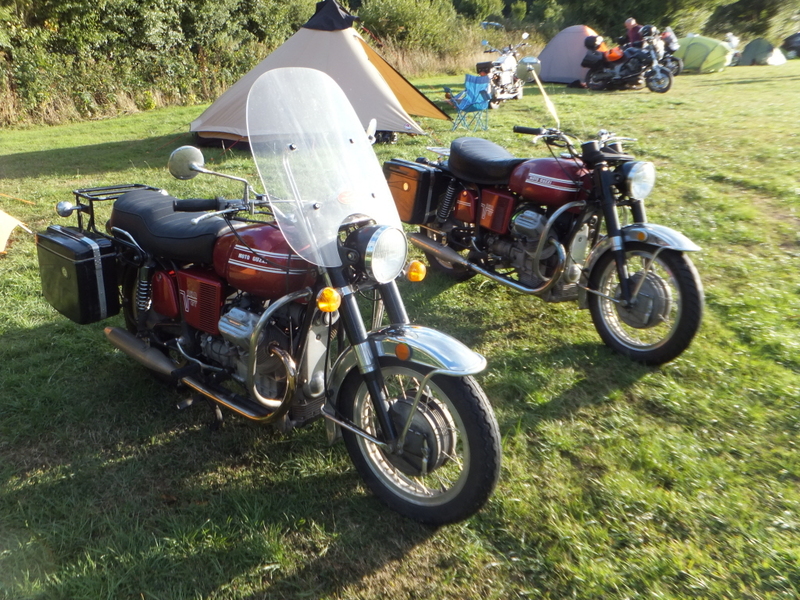 These were the only examples of loopframe bikes at the event and there were no big-block Tonti-framed 750s other than mine. 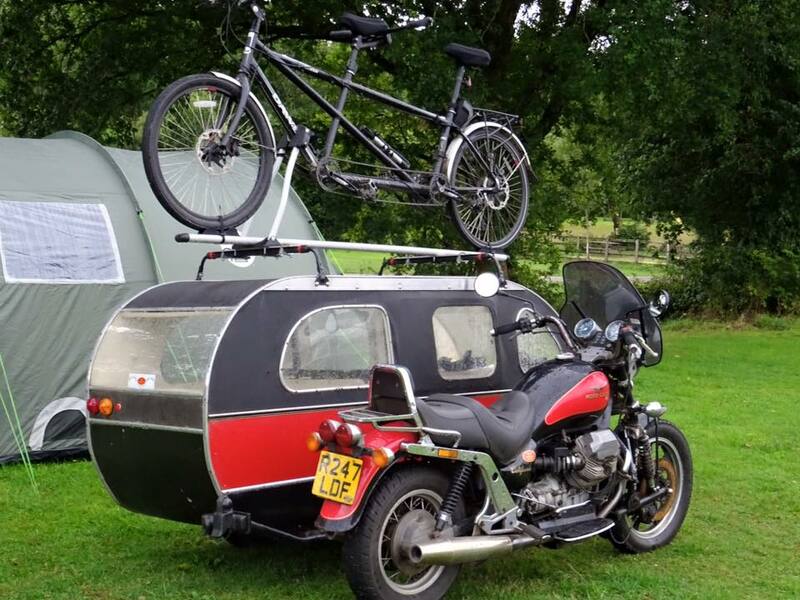 However I had to include this photo of an outfit complete with tandem on the roof rack. 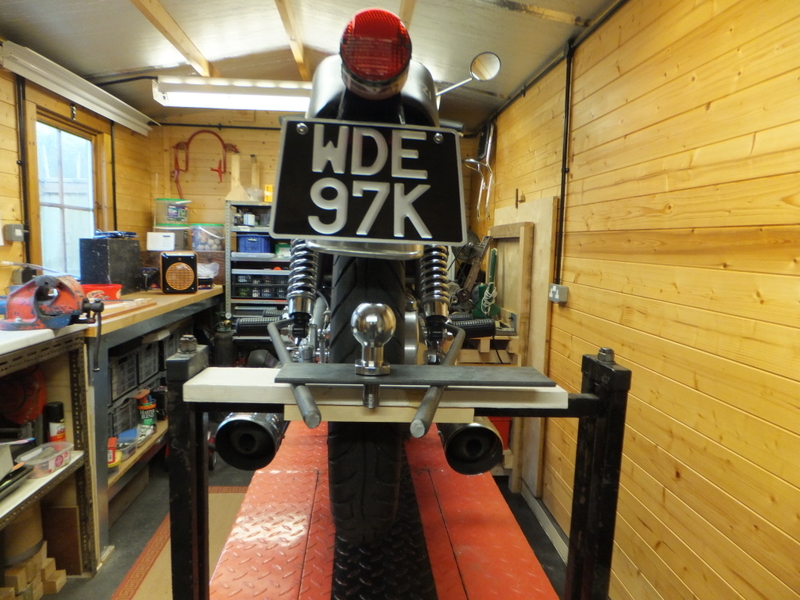 The already large sidecar appeared to have been widened and possily lengthened as well. I’m glad I took my few photos soon after arriving as the following day was wet and miserable for a lot of the time. I decided to not get involved in any ride-outs but wish I’d gone despite the weather. However, there was no reason to get bored on site during the day. The evening entertainment was provided by a Paul Weller tribute act who I thought were pretty good. There was a break in the musical entertainmet for the obligatory raffle and awards. 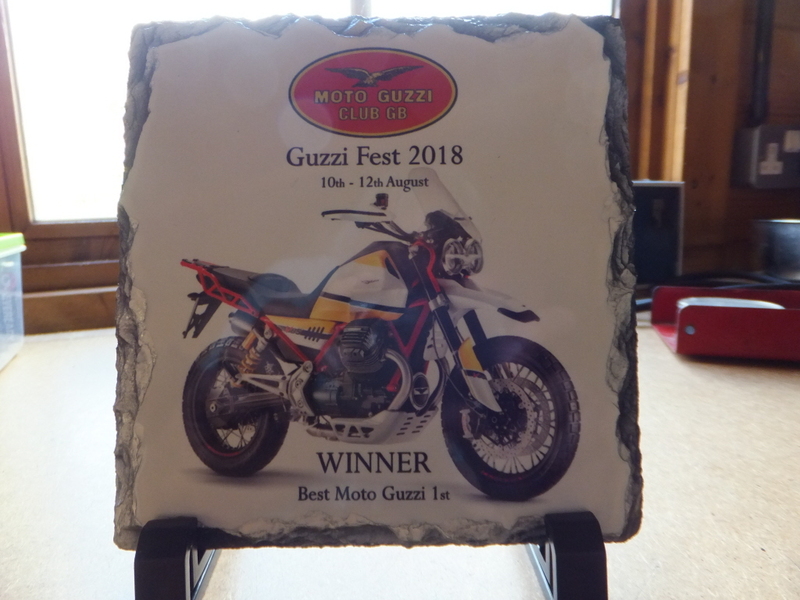 I was chuffed to be given the award for the best Guzzi at the event. Kev came second with his white Eldorado. It was almost dry on the Sunday morning when I packed my tent away to come home. I went for a cooked breakfast, donned my waterproofs and headed out in the rain toward the motorway traffic once more. As it happens the ride home wasn’t that bad. Yes it did rain for some of the time but it was nothing like the deluge that had been forcast. The traffic was easier as well. The Racing Rhino was a pleasure to ride and my wrist survived fairly well. I worked out that it managed 50mpg which I reckon is very good. 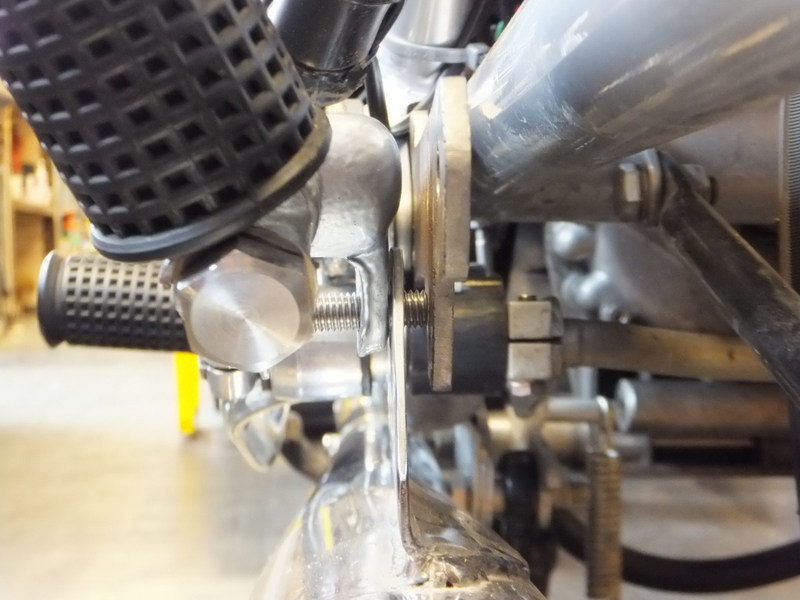 There’s now a leak from the clutch pushrod seal at the back of the gearbox but, you can’t have everything. 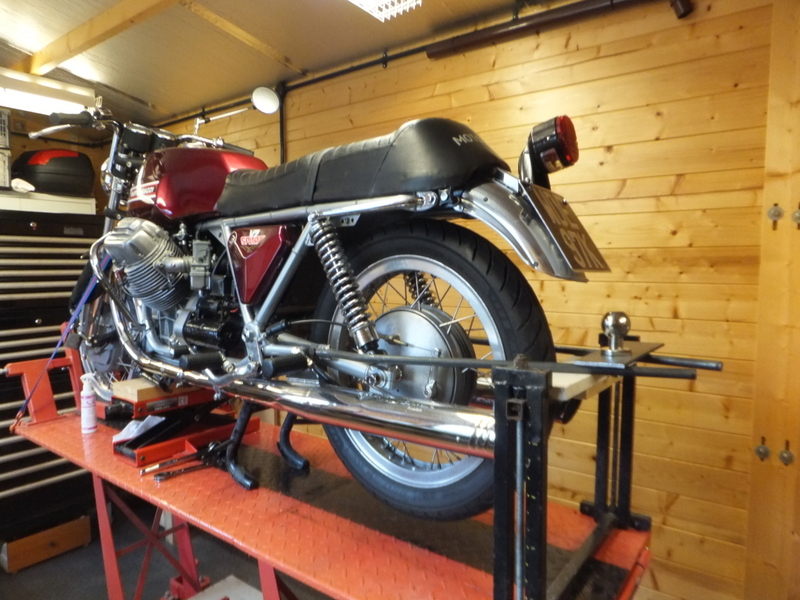 I had spent some time getting The Racing Rhino ready for the trip to the MGCGB Guzzi Festival in Devon. 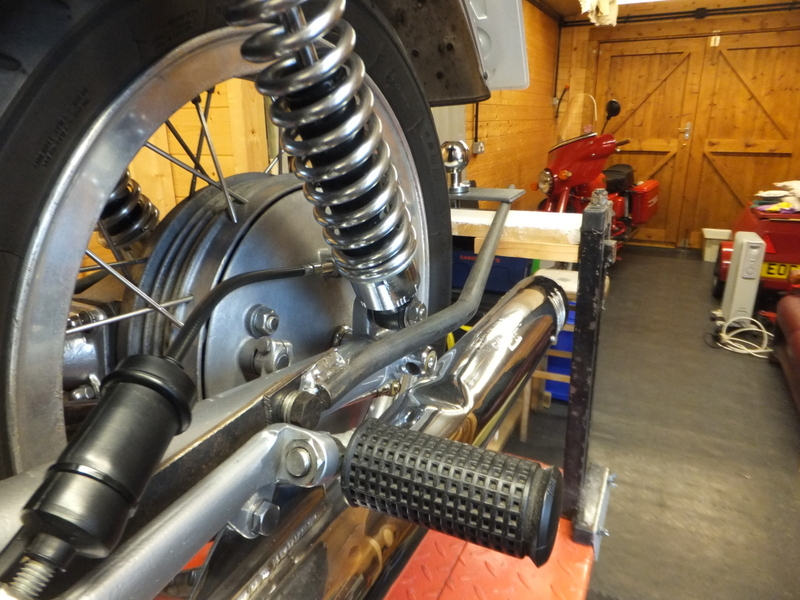 I’d not gone away on it since the rebuild completed in 2015 and had decided that I’d travel light and go on the V7Sport rather than on The Fire Bike with trailer. 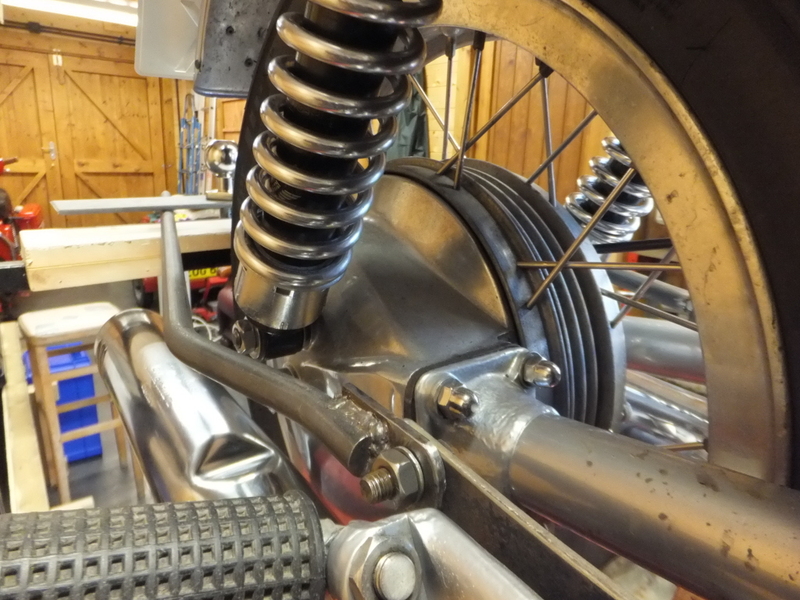 The points were adjusted, valve clearances checked and the carbs balanced. This summer has been very busy and I’ve had to rebuild part of my timber garage/workshop which has rotted badly already. It meant that all had become very disorganised and I was struggling to find things. So I spent a morning trying to restore some order and put the bikes outside to give me room. When I brought The Racing Rhino back in it would only run on one cylinder. There was no spark on the left. I swapped the plugs over on the off chance that it could be a duff plug but that wasn’t it. The last ignition related things I had touched were the contact breaker points. Perhaps I hadn’t tightened a screw properly and the points had closed up. I’d done 50 miles or so since but that had to be it. 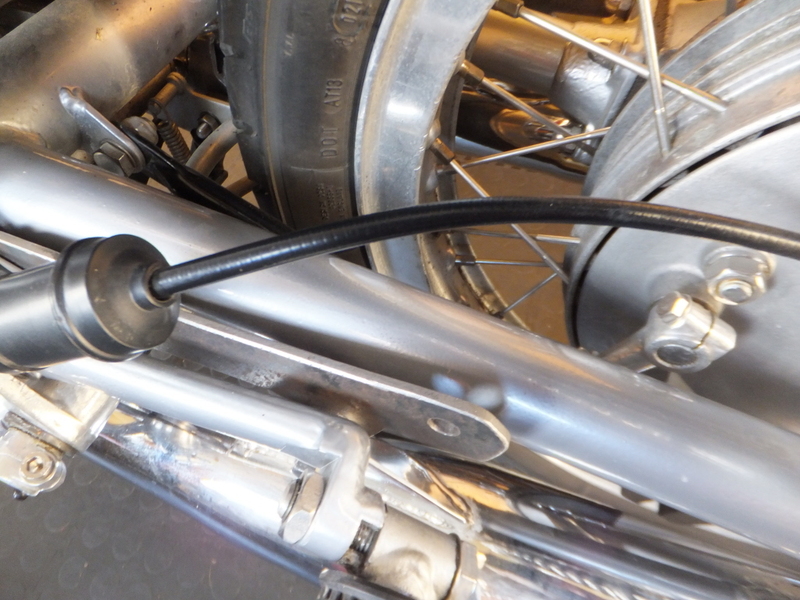 I swore quietly as I removed the fuel tank and points cover to take a look and realised what I had done. It was nearly 5pm on the 8th. I was off to Devon on the 10th and I had a family event to be at on the 9th. 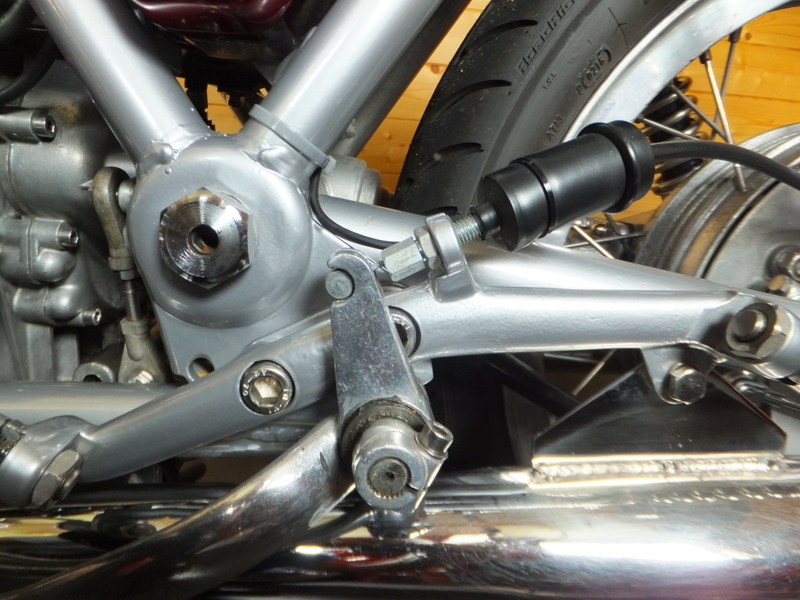 The week before, the tank had been heavy with fuel so I’d tried to adjust the points without removing it. 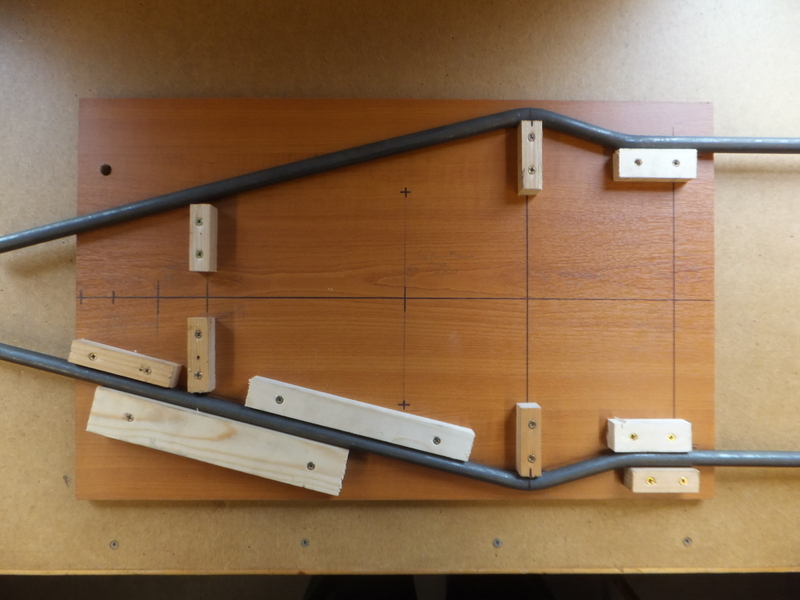 It can be done and I had just moved the points cover to one side. When refitted it had trapped the green wire to the coil for the left cylinder almost totally cutting it through in two places. It had stayed in tact just long enough for my last ride but then expired on the driveway. It’s just as well it happened then and not on the way to Devon. That was lucky! I made up a replacement wire which includes a special connector at the points end. 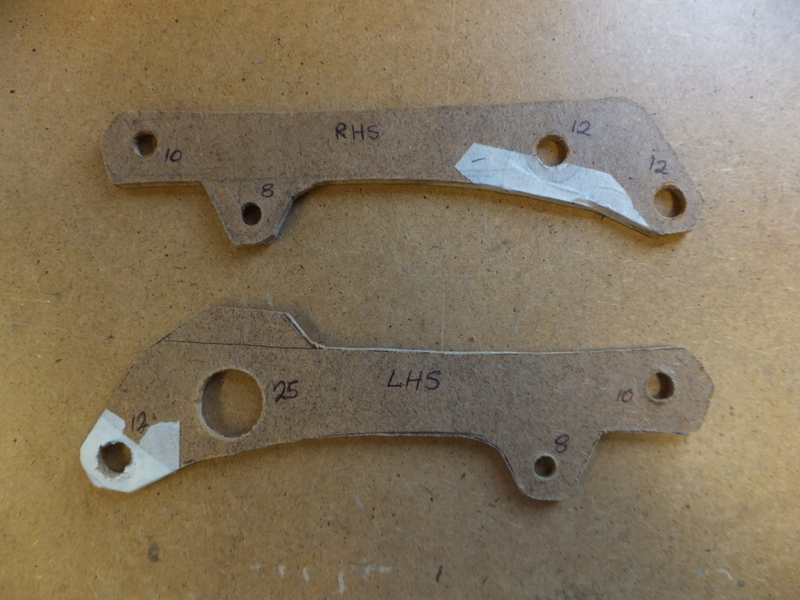 Of course I didn’t have one of these and used a crimp on earth tag which I then cut and filed to shape. My crimping could have been better on this occasion but did the job. The little black thing on the wire is some tape to stop it pulling through the securing block on the “distributor”. 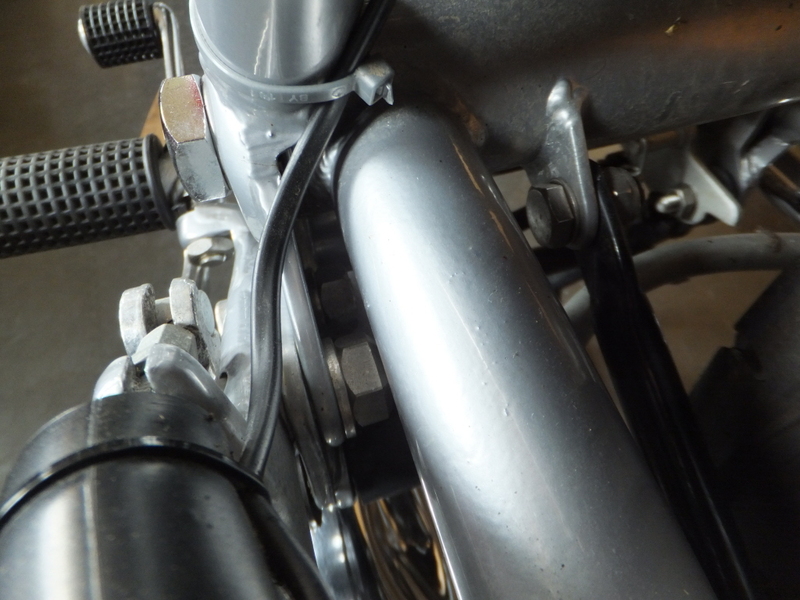 The original wire had a metal eyelet crimped here. With everything back together the panic was over.